The former professor at the University of the Philippines who is well-known as the exiled founding chair of the Communist Party of the Philippines (CPP) send his message to Leni Robredo via online interview from Utrecht, The Netherlands, on Monday. Jose Maria Sison who also known as 'Joma' called the imminent win of Leni Robredo over Ferdinand Marcos Jr. in the vice presidential race. He said, "She (Robredo) stops on its track the long-term drive of the Marcos family to go back to Malacañang, criminally using money stolen from the Filipino people through a bloody fascist dictatorship." Sison congratulated the Vice presidential front runner Leni Robredo as he compared it to her running mate Mar Roxas. He said she had done better in the elections than her running mate. Sison said, "Roxas simply carried the stigma of President Aquino’s kiss of death, merely wishing to continue the discredited daang matuwid (straight path governance)"
According to the news, Jose Maria Sison advised the presumptive president Rodrigo Duterte last year to not choose Bongbong Marcos as his running mate because it might bring grave repercussions on his political plans. "Bongbong is the worst kind. So anyone else is better," said and claimed by Jose Maria Sison. And then, Rodrigo Duterte choose Senator Alan Peter Cayetano as his running mate. Where Cayetano placed third and already conceded to Leni Robredo. Do you agree with Jose Maria Sison? Please Point out your thoughts in the comment section below. 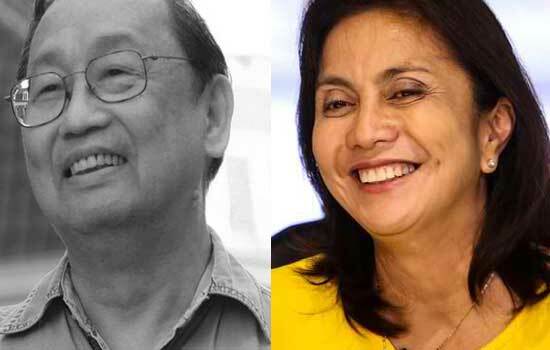 Comments or suggestions about "Joma Sison Congratulated Leni Robredo: 'She done better than her running mate'" is important to us, you may share it by using the comment box below.